This week’s episode stars Karla Bruning as Nyoka Shade & Daria Morra as Troya Nice! We enter into the final 4 episodes of We Might Be Superheroes! This week: Get ready to go on a journey to…somewhere. When Good Foods Go Wrong. When Snacks Roamed the Earth. When Strikes…the Bad Burrito!!! 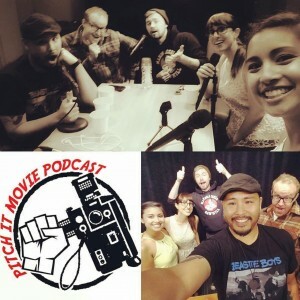 Rica de Ocampo & Alex Covington had a great time on Pitch It-Podcast! Our friends The Ghouligans have a new podcast and we were lucky enough to be on it! No new episode this week. We are down to our final 4 episodes! Next episode is 10/05/16!! Please enjoy the podcast! Don’t forget to follow us on Twitter and like us on Facebook! Ever wonder what happens in the time after the villain captures the heroes, but before they wind up in a sinister deathtrap? This episode is about that time. Can Dirk & Snide (two bumbling henchmen) get the job done? (Damn those death trap instructions in Swedish!) Hope (Rica de Ocampo) & Faith (Alex Covington) literally have their lives hanging in the balance! This week’s guest villain is returning infamous fiend, Heinrich Syphon (Jon Sanborne)! Faith (Alex Covington) & Hope (Rica de Ocampo) find themselves in the police station wrapping up one of their recent adventures. This week’s episode stars Esmeralda Singh and Tom Ciorciari! Remember to like us on Facebook and follow us on Twitter! While on routine patrol Hope (Rica de Ocampo) & Faith (Alex Covington) encounter a new type of superhero called Solid Citizen (Luke Bishow). This episode was directed by John Bishow-Semevolos! Our Superhero webseries is back! Time to catch up with Riley (Rica de Ocampo) & Christine (Alex Covington) as they try to catch up with our other favorites! This week’s episode is directed by Scarlet Meyer!